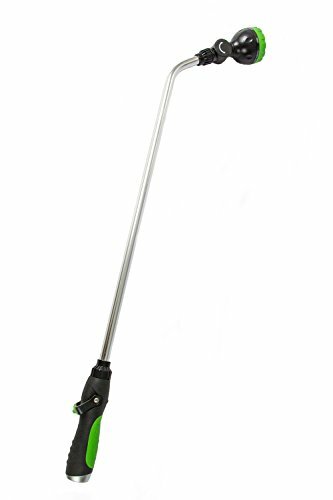 MULTI-PATTERN WATERING WAND FOR GARDENING AND MORE - Multi-pattern Watering Wand by Garden Products USA. Features 7 different spray pattern options for a wide variety of uses. 33 inch long wand perfect for all those hard to reach places! Great to use for hanging baskets, garden planters, and flower beds. Easily connects to your hose or to the Expandable Garden Products USA Hose (sold separately.) Durable and built to last, yet light weight and easy to lift above you head for out of reach hanging baskets! Use with Garden Products USA expandable hose with brass nozzle to make your lawn and flowers flourish. EASIER TO USE THAN EVER BEFORE - Ergonomic grip with easy on/off control valve for water shut-off and flow control. No frustrating trigger pull for easy use. MORE SETTINGS FOR ALL YOUR GARDENING NEEDS - 7 different settings for every garden task! Shower, flat, mist, power wash, rinse, bucket filler, and soaker settings so you'll have the right setting for all your projects. ADJUSTABLE PRESSURE FOR ANY TASK - Powerful enough to wash away dirt and grime on cars, switch the setting and gently water your spring garden. Can be used for any task: deep cleaning, washing cars, gardening, bathing pets, and more! ENGINEERED TO LAST - Combination of plastic and metal construction with bendable and adjustable neck for customized easy use. Perfect for hard to reach places or high hanging baskets. Light weight for easy use and transportation. SATISFACTION GUARANTEED - We guarantee that you are going to love this product! If for any reason you are not 100% satisfied with your purchase, we will refund your money or send you a replacement - no questions asked. Simply send us a message and we will respond within 24 hours. If you have any questions about this product by Garden Products USA, contact us by completing and submitting the form below. If you are looking for a specif part number, please include it with your message.